Benelux manufacturer specializing in gas products. We can consider this company one of the best and most recognized European brands in the production and design of gas fireplaces. Company based in northern Italy. It has one of the largest factories (70.000m2) and modern of Europe, specializing in wood and pellet. Benelux manufacturer specializing in wood products. Its perfect finishing, excellent yields and consistent design makes this company a leader in the European market. 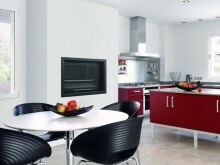 It is a catalan national company with 30 years in the field of manufacturing metal fireplaces, inserts and recovery. It is a leader in the Spanish market, for its wide range of models and their constant innovation in the design and development of new products with the search for maximum energy efficiency. French manufacturer that we can consider the precursor in the manufacture of closed fireplaces. While it is the leading French manufacturer of both recuperators how coatings. We could not understand the world of today chimneys without reference to this manufacturer. Manufacturer of stoves for over 150 years. We can find the range of all life and the latest innovations and designs with this brand. Fabricante alemán líder en la fabricación de estufas a leña, el éxito de esta marca es apostar por un diseño innovador, realizando un producto de altísima calidad tanto en los materiales utilizados como en la perfección de sus acabados.